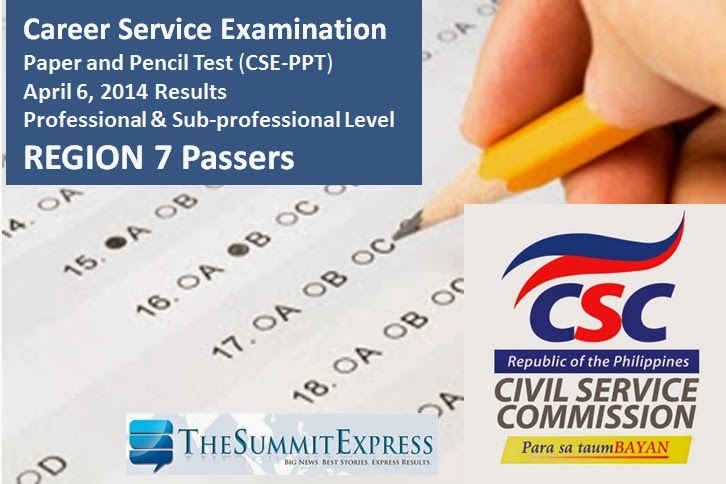 Manila, Philippines - The results of April 2014 Civil Service Exam- Paper and Pencil Test (CSE-PPT) are finally out online on Monday, May 19, 2014. The Civil Service Commission(CSC) has released the list of passers per region for the Professional and Sub-Professional Examinations. Examinees of the April 6, 2014 career service exam in Region 7 (Central Visayas) may now check results on this webpage. A total of 200,000 examinees took the Civil Service Examinations in 52 test locations nationwide, according to CSC. 77 07 288927 ANCHETA, MICHAEL GLENN G.
681 07 288975 LOPEZ, GAYMELO Y. 697 07 289049 MACHAN, BOB JAMES A. 985 07 288963 SAMSON, MAE MARIE T.